Cooking! Cooking! Cooking! It is the hardest chore for a man, especially when he is living all by himself. Most men are capable of cleaning the house at times, but when it comes to cooking, it is definitely a task for most. Most of them use the most convenient option of eating out or binging on ready-to-eat processed foods. Though they seem convenient, they cause innumerable health problems in the long run and are not very economical too. So, here are a few healthy eating and cooking tips for single men. Stock up on fruits. They are loaded with fiber, vitamins, and minerals that have immense health benefits. They also serve as a quick breakfast option and are an instant source of energy. Stock up on nuts. They are a good source of omega-3 fatty acids and are excellent snack options. Just stock them up in a snack box and pop them when you get hungry. Make your own healthy sandwich. 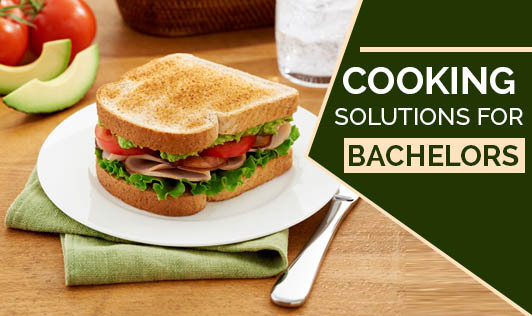 Instead of having that high fat, calorie-rich, ready-to-eat sandwich; make your own healthy version using lots of fresh vegetables, hung curd, and herbs of your choice. Make ready-to-eat meals healthy. Improve the nutrition of your ready-to-eat instant noodles by adding vegetables, boiled eggs, chicken shreds, or cottage cheese. You can also try out new recipes like upma, uttapam, and chilla from your staple oats. Cook more to eat twice. Instead of cooking a single portion, cook more at a time and store the leftovers to eat later. Experiment with your leftovers. If you don't like to eat the same meal again, mix and match your leftovers to make a brand new dish for yourself. For example, if you have left over veggies, rice, and chicken, mix them up with some herbs and spices on a tawa to make yummy fried rice. Make one pot meals. If you are running late, make dishes that serve as a whole meal, such as khichdi, curd rice, or pasta salad. Choose the right dish when you are eating out, because eating out doesn't always mean eating unhealthy. You can always opt for healthy options. Cut down on your calories by choosing fresh lime juice over soft drinks. Choose grilled, roasted chicken and kebabs over fried chicken. Lastly, play your favorite music or sing along to your favorite tune while cooking and see how relaxing and fun cooking can be!